Why Can't I Feel My Toes? A common question I get asked is why do I have numbness in my feet/toes? It’s a simple question but but there can be multiple answers depending on you and your medical history. Numbness in the feet and toes is often accompanied by other symptoms like a tingling sensation, a feeling of pins and needles, as well as a burning feeling. This can either be when you are walking and on your feet, or can occur when you are off your feet at rest. When it occurs is an important piece of information your doctor will need to know in order to give you the best answer as to why you are feeling numbness. Shoes- A very common and easily remedied cause of numbness is ill-fitting shoes, often shoes that are too small or put pressure on the toes. High heeled shoes with a pointed/tapered end have been known to cause numbness in women especially in the pinky toe. But men, don’t think you are immune to this problem; many styles of men’s’ dress shoes are also slightly tapered at the toes and can cause compression. Although you may not feel numbness in the toes initially, after wearing shoes that are too tight or those that don’t have enough room in the toe area can cause symptoms to develop. Back Problems- Numbness in the feet/toes can also be a result of recent or old issues in the back. Since the nerves that innervate all the muscles and skin of the legs and feet originate in the spine, any issue with the lower back has the potential to cause numbness and other symptoms in the feet. A very common back problem like a herniated or slipped disc often has numbness in the feet/toes as the hallmark symptom. Diabetes- The most common cause of toe/foot numbness that I see everyday is diabetes. Believe me when I say, diabetes is a chronic disease which can affect your entire body. Over a long period of time, elevated blood sugar levels causes the nerves in the extremities to malfunction. This condition is called neuropathy. When the nerves in the feet/toes are damaged, numbness can occur as well as the symptoms I mentioned earlier. Because the feet may not be able to feel pain, sores or ulcer can develop which can then lead to infection. Without the body’s ability to feel pain, our early warning system that usually lets us know something is wrong cant work. As a result, problems can fester and become worse over time. 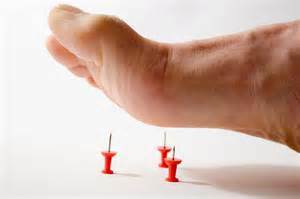 If you suffer from numbness in your feet or know a friend or relative who does, have them see a foot specialist. We here at Family Foot & Ankle Specialists will be happy to see you in either of our offices in Piscataway or Hillsborough and help diagnose your problem and give you a treatment plan that will put you on the path to proper foot health. The earlier you treat your problem, usually means a better outcome.